The photographs that Jordi S. Carrera presents in this exhibition are introduced by some of George Steiner's well-known words, in which the scholar reminds us that the urban landscape of the old European cities is shaped certainly by stones, but these stones would be meaningless without the impact of the passage of time. 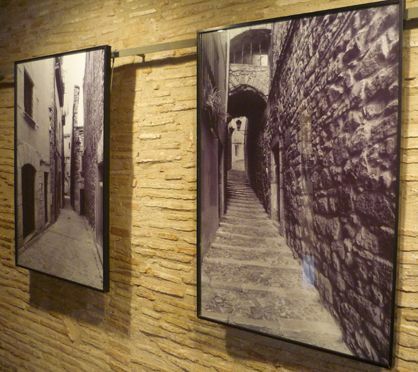 This is the case with the Call, or Jewish quarter, of Girona, completely constructed of stone, which has acquired not only its beauty, but mainly its character, from the slow dripping of the passing years upon its surface. Then the shadow dissolved into thicker shadows and the gloom took with it the point or light. It is, I believe, this informing brush of time's hand, of the subconsciously felt pressures of history, more often than not tragic, on physical surroundings, on roof-lines and landscape, even, at enigmatic instants, on rivers and winds, which is most vivid.